This evening we got up early and were at Costco when they opened at 9:00. We didn't even eat breakfast before we left; just stopped at got a cup of coffee at Dunkin Donuts on our way. Costco had their fresh bouquets of flowers on sale for $7.99 a bunch so I picked up a huge bouquet of beautiful sunflowers. I also bought two huge yellow mums to put out on the front porch since it's finally beginning to cool off and feel like fall. Of course I picked up some other stuff, too! We got back home by 10:30 and I made us a quick and easy breakfast of cheddar scrambled eggs, bacon and yogurt for our late "brunch". We decided to take the afternoon off from projects around the house for a change and to stop and just relax for a change. We sat out on the porch for hours this afternoon, reading and drainking coffee. When we came back inside, I laid down and actually fell asleep on the sofa and took a 3-hour nap. How crazy is that? I never EVER nap. I think it was all the fresh cool fall air. When I woke up at 6:00 p.m. this evening, I was dazed and confused...LOL. I decided I'd better get a quick start on dinner and didn't really have a plan so I pounded some boneless skinless chicken breasts I had in the fridge and seasoned them with salt, pepper and smoked paprika, spritzed them with olive oil and grilled them. They only took about 8 minutes or so to grill. While the grill was heating up, I turned on the oven and pulled out a head of cauliflower, a large crown of broccoli and a couple of organic carrots and cut them up, tossed them in olive oil and seasoned with salt, pepper and smoked paprika and popped them into the oven to roast for about 25 minutes. Literally, dinner was on the table in about 30 minutes! Oh, I picked the beautiful head of cauliflower at Sprouts Farmers Market yesterday for 77 cents! They were on sale for 77 cents each so I bought 2 heads (about 3-pounds each). After dinner, we sat out on the porch for another hour or so and enjoyed being serenaded by the crickets and frogs along with the sound of acorns falling out of the oak trees in our backyard. 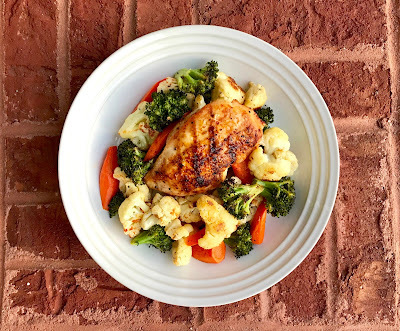 I snapped a few photos below and included the easy recipe for my Roasted Vegetable Medley that I served the grilled chicken on. 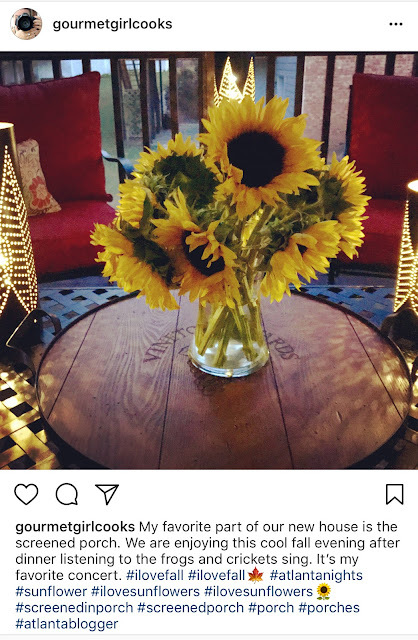 I also shared a snapshot taken of my beautiful sunflowers I posted on my Instagram post below. Do you follow me on Instagram yet? Enjoy! 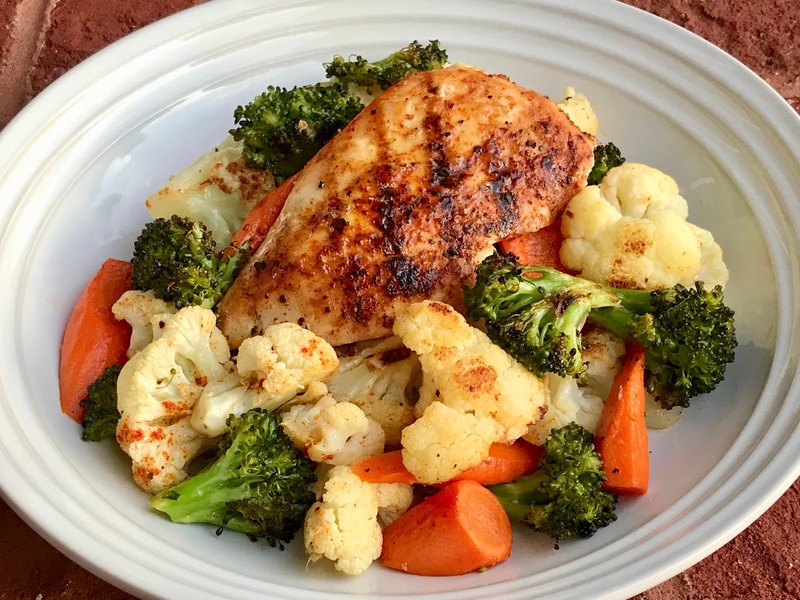 Preheat oven to 425 degrees F. Toss cauliflower, carrots and broccoli in a bowl with olive oil, salt and pepper and toss until vegetables are coated. Spread out in a single layer in a large roasting pan. Roast for 15 minutes; remove from oven, stir and lightly dust with smoked paprika. Return to the oven and roast an additional 10 to 15 minutes or until vegetables are golden brown.